I have to tell you – I’m having so much fun as a member of the Eagle Rock Railroad Historical Society! 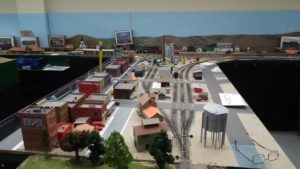 I’ve made new friends, we’re having a great time working on the layout, visiting, and laughing and joking. On top of that, I’m learning a lot about what Idaho Falls was like decades before I was born. 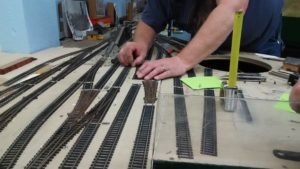 This week, Vet continued laying ballast on the yard tracks and the mainline track that runs through the yard, and working on ground cover just south of the stockyard. 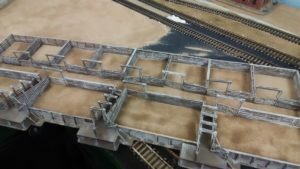 Vet “painting” the glue on before adding ground cover. 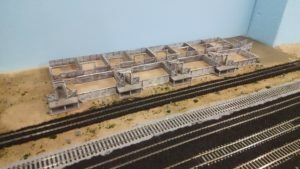 Some of Vet’s ballast work here in the foreground. 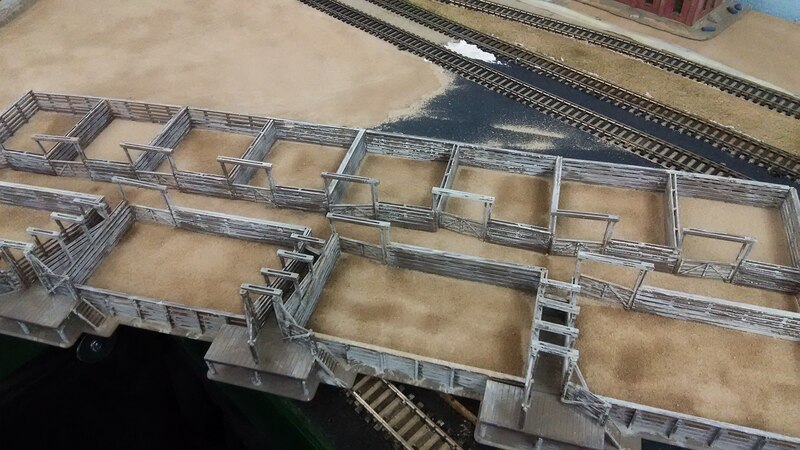 Meanwhile, I worked to add a gravel lot to the south end of the stockyards, where trucks would deliver cattle and feed. I used a mix of ground cover that Vet mixed up to be more of a grey/gravel color. The glue was still wet in this photo, it should dry lighter than this. This week I’ll add a few weeds to it. 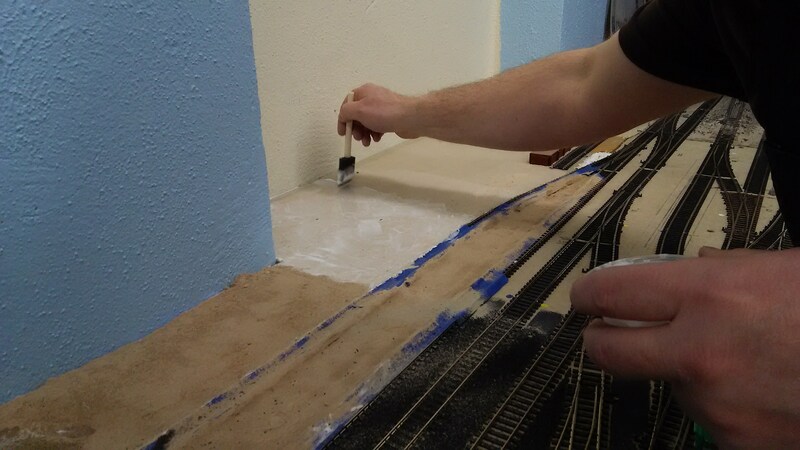 While the glue for the styrene base under the gravel was drying, Tim and I worked to just clean up the Eagle Rock area of the layout. Eagle Rock was the original name of what became Idaho Falls. To give you an idea of where it was located, Broadway and the Idaho Falls Public Library now occupy some of that land. 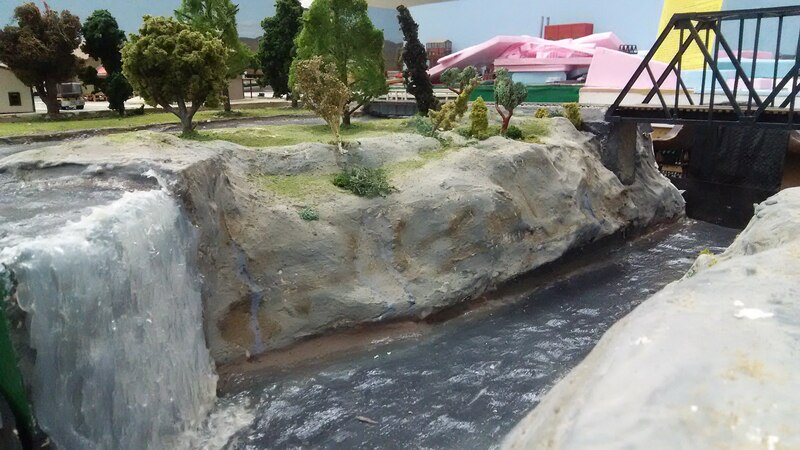 The Eagle Rock area on the layout is still a work-in-progress, and we’ve been making some plans. 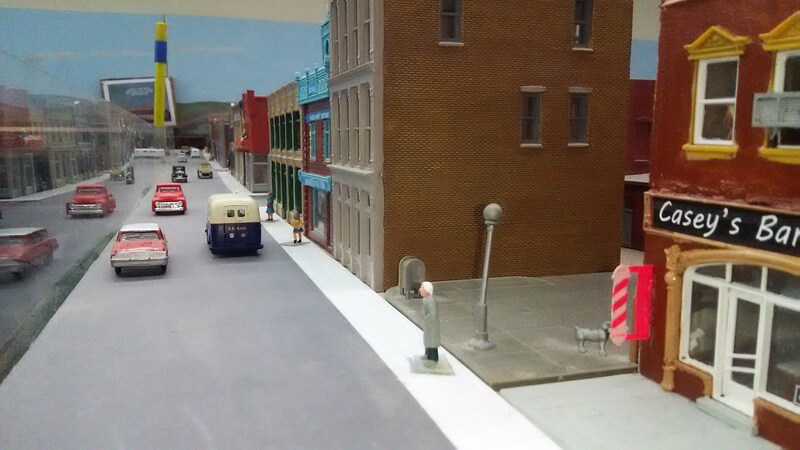 In the meantime, however, it had just gotten pretty dusty (that happens), so we took some time to clean it up a bit – wiping down the sidewalks and sweeping the streets with a couple of dry paint brushes. Broadway looking east. The next street to the right is Market street, which is now gone (the parking lot behind Chesbro Music and the Idaho Falls Public Library occupy that space). The ground where the State of Idaho building resides on Yellowstone was once occupied by a grain silo, seen here in the background. Currently, most of the buildings are placeholders, and the space is compressed. 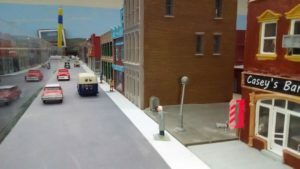 The goal is to give the general idea of what this part of downtown Idaho Falls looked like in the mid 1950s. Although I’ve made it my personal mission in life to make sure the Rio Theater is represented. 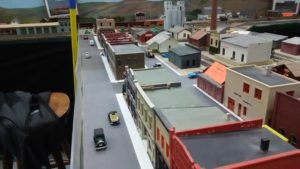 While Vet worked on the ground cover near the yard and Tim and I cleaned up downtown, Dave was busy actually working on the railroad! 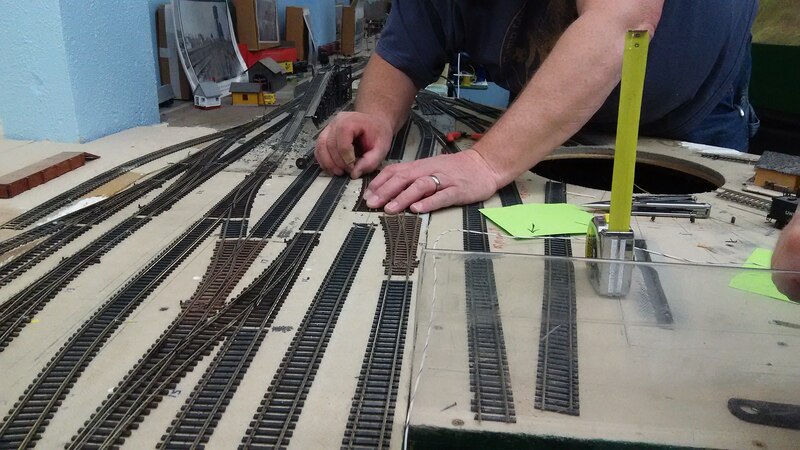 He spent the evening (and actually some other time during the week) replacing some bad turnouts (switch tracks) in the yard near the loco servicing facility. 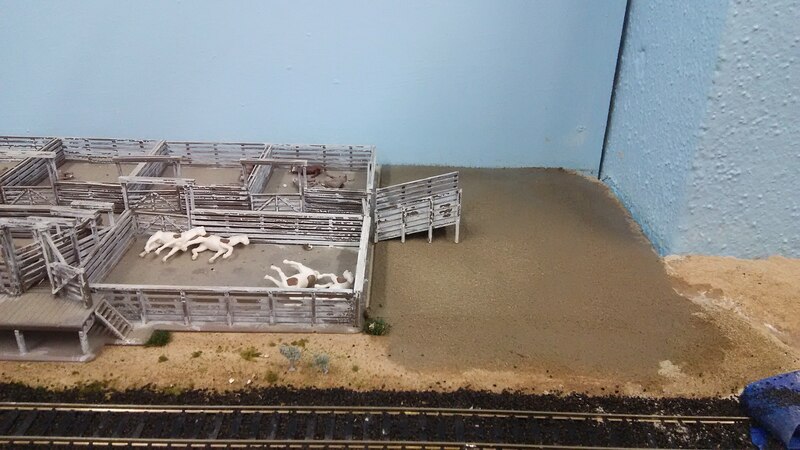 To finish out the night, I decided to add some ground cover inside the stock pens, so that it didn’t look like the cows were standing on grey plastic. 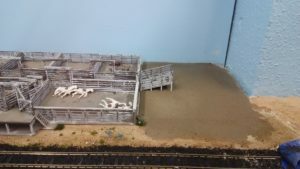 Next week I’ll add a few weeds in (but not too many, the cows would probably eat them after all). 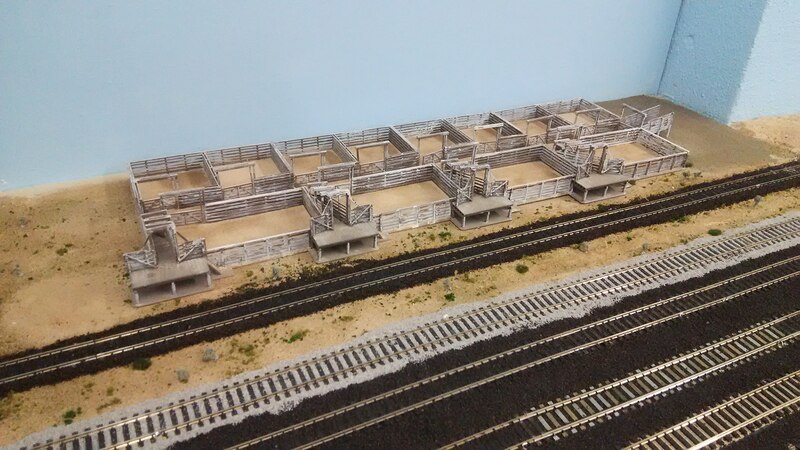 I also have some HO scale hay bails on order to help finish out the scene. Tim had also made some more beautiful trees, which I promptly forgot to take photos of. I’ll have to remember that this week. Sorry Tim! 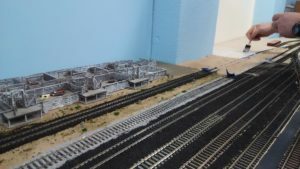 Previous PostERRHSI Layout Update – April 14, 2018Next PostSTAR WARS: RESISTANCE!